Here is a card I made for the occasion using a stencil. I love stencils because they are easy to use and very reasonably priced. I especially love stencils that have abstract patterns or images. You can use the entire stencil pattern or just part of the stencil depending on the design of your card. The stencil I used for this card is made by The Crafter’s Workshop (aka TCW) and is called Confetti. I fell in love with it because it had two of my favorite types of images, hearts and splatters/ink blots. Cut a piece of white cardstock to an A2 size (4.25” x 5.5”). This becomes the card front. Lay the stencil over the cardstock and tape the stencil down securely over the cardstock onto your work surface using removable tape such as 3M’s Post-It tape. 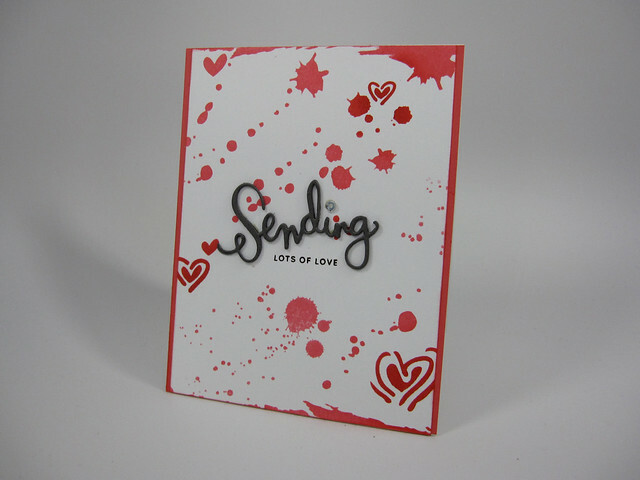 Using an inked mini blending tool, go over the open areas of the stencil that you want inked onto the card front. In this case, I used two Papertrey Ink ink colors, Berry Sorbet (for the splatters and ink blots) and Pure Poppy (for the hearts). For the sentiment: I die cut the Sending die from Simon Says Stamp 3 times using Curious Metallic paper in Gunmetal. This is one of my favorite metallic papers. It is a dark gray, but not too dark. The subtle shimmer is really nice as well. I glued the 3 die-cut pieces on top of each other using Tombow Mono Multi Glue. I did this for dimension. I really like dimension on my die-cut sentiments. Placing the die-cut sentiment on the card front, I marked where I wanted it placed with light pencil marks. I did this so I would know where to stamp the “LOTS OF LOVE” sentiment (from Simon Says Stamp’s Paper Hugs stamp set. I stamped this sentiment using PTI’s Smokey Shadow ink. After stamping the sentiment, I erased the pencil marks and glued the “Sending” die-cut right above the stamped sentiment. I added a small silver sequin (from Pretty Pink Posh) right where the dot for the “I” would go for the “Sending” die cut. To complete the card, I trimmed down the card front (1/4” all around) and mounted it onto an A2 piece of PTI cardstock in Berry Sorbet. I then mounted all of this to a portrait-oriented, top-folding A2 card base (Neenah Solar white 110#). Summary of supplies used in making this card: Stamps: SSS Paper Hug stamp set; Dies: SSS Sending die; Stencils: TCW’s Confetti Stencil (6”x6” size); Inks: Papertrey Ink: Berry Sorbet, Pure Poppy, Smokey Shadow; Cardstock: Papertrey Ink: Berry Sorbet, Neenah Solar White Cardstock (80# for card front, 110# for card base); Other: Ranger Mini Ink Blending Tool with foam applicators, Tombow Mono Multi Glue, Pretty Pink Posh silver sequins (4mm).